Seeing my dwarf iris bloom this weekend kind of caught me by surprise. 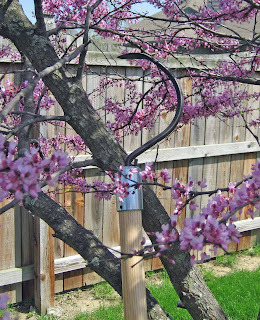 I went out into the back yard Saturday morning and there it was in all its purple glory. 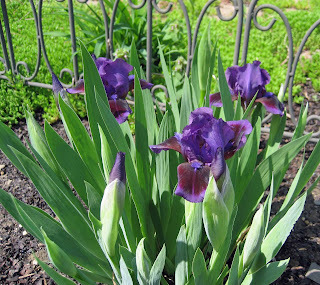 I only have a few other bearded irises, and they won't start blooming for a few more weeks. That's why I was surprised to see this one blooming in April. In fact, those other irises don't even have any buds showing. This dwarf iris is only a foot tall, if that, and has a nice iris scent. Smelling it, I was reminded that when I visited the Natural Gardener during the Spring Fling earlier in April, I completely missed seeing their big iris display, planted for the American Iris Society Convention, held in Austin in mid-April. 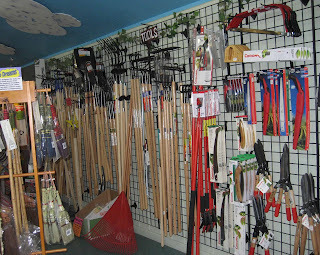 the garden tools, including quite a few hoes. I went through the display noting "have", "have", "don't have", "have", "have", "oh, I'd like that one", "have". You get the idea, you know the story. I have 15 working hoes (bought new), five old hoes that are just for having, and one hoe head from a hoe my Dad had. Oh, and several hand hoes. One of the hoes on display at the Natural Gardener that I didn't have was a Cobrahead Long-Handle. But thanks to the wonderful people at Cobrahead, now I do. After I took the official picture of the new Cobrahead hoe for my hoe collection post, I put it into action to see if I liked it. And I like it. The working end up of it is quite sharp, just like the short-handled version that I got for Christmas, which makes it very nice for cutting out weeds, especially in tight quarters. It also did a good job breaking up the ground, which is one of the key features of a good hoe, though I'll admit if I had a big area to cultivate, I'd choose one of my other hoes with a larger head. But this one did a great job of making a nice long, fairly deep, furrow which will be good for planting beans and corn later this spring. The smaller head on this hoe also makes it good for working in close quarters around plants. I used it to knock out quite a few weeds in one section of a perennial bed, and never missed and cut off a perennial by accident. I can see myself of an evening, strolling around the garden with this hoe in hand, using it to cut out weeds that dared sprout behind my back in my vegetable garden or perennial border. A lot of gardeners have commented that they don't think they need or want a hoe because they don't have a vegetable garden. For those gardeners, I would suggest a hoe like this one, with a sharp, smaller head to get around closely planted perennials. "Hoes... they aren't just for vegetable gardens..."
It's all hoes all week here at May Dreams Gardens, leading up to the one time only Garden Bloggers' Hoe Down on Saturday, May 3rd. To join in, post about your hoes (or rakes or shovels) on Saturday, then leave a comment on my hoe down post so we can find you. You know it will be fun and a good time for all! carol - that is one mean looking hoe! I would love to see a video of you operating that particular hoe as Im having trouble seeing how it works. Have you ever considered makeing a Hoe video? All hail, fellow long-handled Cobrahead owner! Not having a veggie garden, I have put mine to use in the mixed borders in the back 40 and can vouch for its being a very useful tool. There are weeds sprouting in one of the paths that should be quaking in their roots because they're next on its hit list! I've never seen a hoe like that but I can imagine how handy it is. What a lovely surprise for you. Isn't this time of year just full of surprises each time you walk out into the garden. I hate not to walk about less than twice per day at this time of year. It becomes addicting to find those little surprises. I have my hoe pictures but since I only have 2 hoes I will save them for next weekend. I really like the one pictured here. I would use it if I had it and I don't have veggies. Just a few herbs sprinkled around the garden. I need one of these hoes after reading the way you describe how it does in the garden. Time to make a trip. You give a good sales pitch for both the long handled and short handled cobra head. That was going to be my main focus for the hoe down post, so now will look elsewhere for a star. I do like the way those cobraheads take care of weeds in tight places, especially around the iris rhizomes, a hard place to weed safely. Your dwarf iris is gorgeous. Ours looks very similar, I love the blue beard, and blooms way ahead of the tall ones by several weeks. Now back to the drawing board for the hoe down! 21 hoes? That's a whole lotta hoes! Maybe it's like me and garden gloves. I think that now I have 14 or so pair. Fashion for the garden! I think I need that hoe. I was looking at our hoes in preparation for the hoe-down, and noted a trend...all of our hoes are hand-me-downs from Don's Grandmother (maybe even the Great-Grandmother) which makes most of them well over one hundred years old. I deserve a new one, don't you think? I'm not fascinated with hoes like you are, but that Cobra Head looks like something I need to have. Thanks for showing it to us. Gina, A hoe video? I wouldn't know where to start! Beckie, Actually I got the hoe after the Spring Fling, shipped to my house. I don't think you could get through an airport carrying a hoe in this day and age! Cindy, As sharp as the Cobrahead is, those weeds should be afraid. Their days are numbered in my gardens, too. Verobirdie, Thanks, I'm glad the weeding post was helpful. Lisa at Greenbow, I look forward to seeing your two hoes posted for the Hoe Down. Really, this cobrahead would be good around flowers. Frances, Oh, no, I didn't mean to take your post idea from you. Post your cobraheads anyway! Patientgardener, Yes, post your unused hoe and then maybe we can talk you into using it. Robin (Bumblebee), I have a lot of gloves, but not 14 pairs! That's quite a few. Sherry at the Zoo, Maybe you should ask for a new hoe for Mother's Day and give me your old hoes? Dee/reddirtrambling, Indeed, the Cobrahead is a fine hoe. Gail, LOL, we'll all be out in our gardens chanting the same thing! I was at our state master gardener convention last week and they ran out of those long handled cobra head tools before I could buy one. I have two of the regular type. But I really really want that long handle. Maybe just a little obsessed.